Manila, 23 June 2015 – Sofitel Philippine Plaza Manila cultivates a lifestyle of wellness as it holds the 2015 Sofitel Manila Half Marathon. 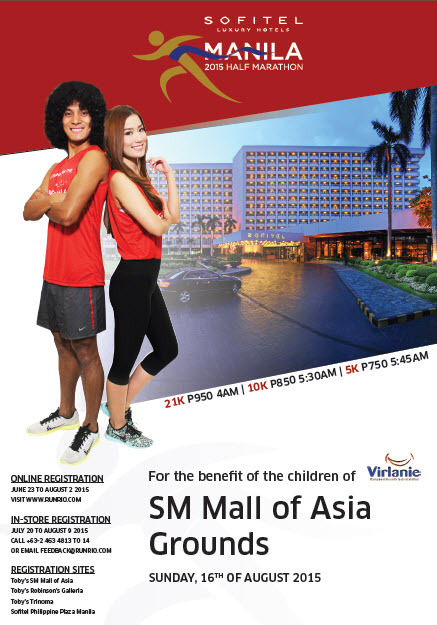 First held in August 2014 in partnership between the only 5-star luxury resort hotel and premier running event organizer, RunRio led by Coach Rio de la Cruz, the Sofitel Manila Half Marathon is a hub for runners and wellness enthusiasts uniting in an effort to support the children of the Virlanie Foundation. “Over 4,500 runners joined us in last year’s Sofitel Manila Half Marathon. The event aims to bring us at level with similar international runs such as the Singapore Marathon. More importantly, the Sofitel Manila Half Marathon is an event with heart as the collaboration with RunRio and our featured partners are to support and uplift the lives of the street children of Manila through the Virlanie Foundation,” shares General Manager, Adam Laker. The 2015 Sofitel Manila Half Marathon will feature 3 categories at 5K, 10K and 21K to be held at the Mall of Asia Grounds. The marathon takes runners through a panoramic view of the bay area showcasing the scenic surrounds and promoting a green lifestyle encouraging runners to bring water bottles for refilling at designated hydration stations, minimizing the use of paper and plastic cups. “With the Sofitel Manila Half Marathon, we hope to create a bigger platform and be among the world’s most popular running events attracting both amateur and professional runners. This marathon is dedicated to the children of the Virlanie Foundation as we strive to make a difference in the lives of the children of Manila,” shares Coach Rio de la Cruz. Sofitel Philippine Plaza Manila and RunRio invite you to be part of the movement. Online registration commences on June 23, 2015 and in-store registration shall start on July 20, 2015 at Toby’s Mall of Asia, Toby’s Robinson’s Galleria, Toby’s Trinoma and Sofitel Philippine Plaza Manila. Log on to www.runrio.com for more information on a truly exciting and meaningful race. Registration fees for the available categories are at Php750 for 5K, Php850 for the 10K and Php950 for the 21K. All participants shall receive event race bibs, singlet and finishers’ loot bag. Runners on the 21K category will also receive a finisher’s shirt and medal. An assortment of cash and lifestyle prizes are in store for some of our top running enthusiasts. This event is co-presented by the Philippine National Bank and Cebu Pacific GetGo. The Sofitel Manila Half Marathon is made possible by the following sponsors: Gatorade, Timex, Salonpas, Subaru, Althaus Philippines, Star Xpo Enterprises, Delsan Office Systems, The Real Deal Company, The Cream Factory, Certified Calm, Kleen Kanteen, Toesox and TFC & Saforelle. Media partners include: ANC The ABS-CBN News Channel, AXN and Sony Channels, Businessworld, Fox International Channels, Philippine Daily Inquirer and The Philippine Star. For more information, please call +63-2 463 4813 to 14 or email feedback@runrio.com.